Geography and social life of Mykonos (Meconos, Mikonos, Mekonos) Island, Cyclades (Kiklades, Kyklades) Islands, Greece, Greece Tourism, Information for Tourism in Greece. 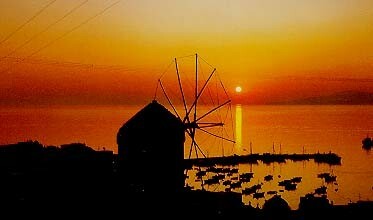 Mykonos lies in the center of the Aegean to the southeast of Tinos. It is approximately 85 square kilometer and a population of approximately 6000. It can be reached both by air and sea. During the season, there are several flights from Athens and connections with Crete, Santorini, Rhodes, Samos and Mytilini. The airport is a destination of charter flights from several European countries. 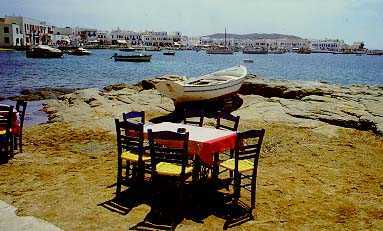 Mykonos is also surrounded by about 11 islets, favorable for fishing, diving and wind-surfing. Rhenia is approximately four times the Delos island and separated from the latter by a channel of 700 meters at its narrowest point. Actually it consists by two parts linked by a very narrow isthmus. Rhenia is, like Delos, hilly and treeless. A small number of local farmers live and graze their coveys there. By sea Mykonos is reachable from both Piraeus and Rafina. In the summer season there are many connections with other Greek islands including Ios, Santorini, Naxos, Paros, Samos and Rhodes. Flying dolphins as well as catamarans make the same journey shorter, but there is always the alternative of a cruising along Evia, Andros and Tinos. Sea transportation and timetables can be effected by the «Meltemi» (a strong wind which often blows from the north during summer especially in August). The terrain of Mykonos is mostly stony and hilly. The highest point is «Profitis Ilias Anomeritis» and «Profitis Ilias Vorniotis». The island is almost treeless. In spring time Mykonos becomes verdant, as the wild flowers bloom for a short time, before they die by the dazzling summer sun. The lack of potable water is a problem. People are forced to use old wells when the desalination plant fails to provide enough and the ships are unable to dock due to rough seas. The island produces very little. Fresh fruit and vegetables arrive by boat, but local melons are particularly recommended. You may still see locals with mules selling local products. Locals still produce their own wine, although their is no commercial utilization. One of the most famous products is «kopanisti» (a special kind of cheese) on which «mostra» (a local delicacy) is based. In the past, there was a great product of flour as there were about 28 windmills operating although for the local needs only 2 would be enough. Lead, silver and barite deposits of the island ran low, but evidences still exist at Kalo Livadi. Mykonians earned their living from both the sea and the land. Nowadays, the greatest source of income is tourism and its associated «industries». Through the winter months, the majority of the islanders are occupied in building-constructing and renovating their properties to be ready for the next season. The natural sources of the island is the sun, the sea and the wind, elements that helped developing a unique tourist resort with an international reputation. The monadic architecture style has also played its own part as such the hospitality, adaptability, tolerance and wit of the Mykonians. They have remained simple, direct people even though more than 10 millions of people visit their native land influence them every year. The island has a continuous development due to good communication links with the mainland and the other islands as with the rest of Europe during the summer season. Some of the traditions and customs of the island are still alive and observed nowadays. For example on the «Epiphany Day» -the locals call it «the Cross day», everyone goes to the harbor. After the Mass, the priest throws an ancient and priceless cross into the water. Then the local young men dive for it into the sea The one who retrieves it, is both blessed with good luck and rewarded, for his successful effort into the cold winter waters of the harbor. On «Clean Monday» (shrove Monday & the first day of the Lent) there is a great exodus to the countryside, especially to the beaches, for kite-flying and pick-nick with seafood and Lenten snacks. The Mykonian carnival, which lasts for three weeks, is one of the most impressive, while locals dressed with fancy clothes and masks walk around the town, teasing people and making jokes. The roads of the island are in a satisfactory condition, thanks to the Local Authorities efforts, but the weather and the land, has as result dangerous road curves and road edges. The Mykonian tradition to build low stone walls around their land properties, blindfolds the drivers to estimate right the curves. So low speed is strongly recommended. Stone walls are not built, just bunches of rocks, placed the one on the other and fixed by cement on the top.